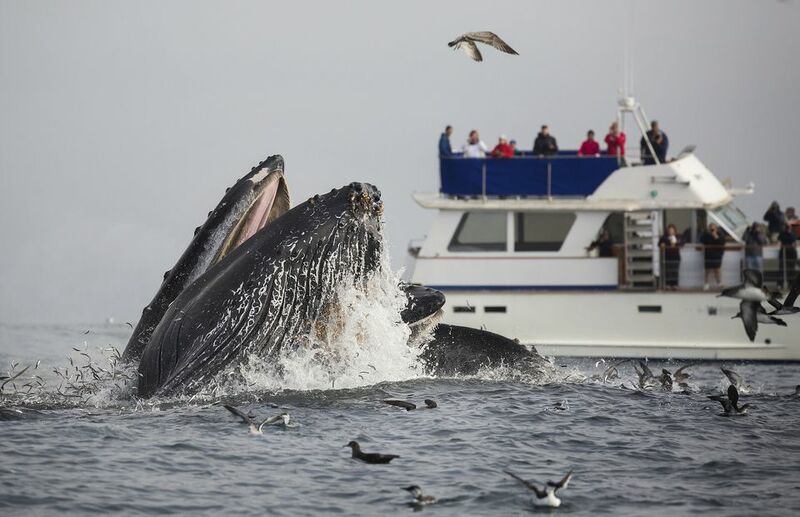 In California, whale watching is a popular thing for tourists to do, and it's no wonder why. With some of the world's largest mammals migrating past coastal points, feeding near the coast and swimming in inlets, you'll find plenty of ocean creatures to see. Individual species have their seasons, but you can find whales off the California coast almost any time of year if you know when and where to look. Check the whale watching calendar in the guide to when to guide to whales and dolphins in California. Whale watching cruises range from a two-hour jaunt out of a local harbor to multi-day cruises to Baja, Mexico. In winter, you can find them leaving from harbors and marinas along the entire California coast. Do they use a sighting network? Will a naturalist be on board? What is their training? What is available on the ship? Is there is a galley or snack bar, or should you bring your own food? Are there plenty of places where you can sit down? Are they a member of a Whale Watching Operators Association? Will they take you out again for free if you don't see a whale? Besides all the technical details, the customer experience is also essential. You can check ratings for whale watching companies at Yelp or Tripadvisor. Is a Whale Watching Cruise Worth Your Time? On the best of days, anyone who was aboard would answer a resounding yes to that question. However, whale watches take up hours that could be spent seeing something else. On a day with only a few sightings (or even worse, no sightings), it's probably not the best use of your time. It's harder to answer that question for everyone because we all have different priorities, but these suggestions can help you make the best decision for yourself. Check very recent sighting reports from one or two companies in the area you want to leave from. When you look at a company's whale sighting report, keep in mind that it is for a whole day, which may include several trips. Think about how important a chance of seeing a whale is to you compared to other things you could be doing. Have the right expectations. Wild animals don't appear on command. Some days, you might not see a whale at all, and on others, you'll see several. Dress warmly in layers. It will be colder out on the water than it is on the shore any time of year. Plan for a temperature difference of 20-30°F. In winter, you may want to bring gloves or mittens. If you forgot them, a clean pair of socks makes a good emergency substitute. Even if it isn't raining, some of the smaller boats can kick up quite a spray. Bring a waterproof jacket with a hood. Wear sunscreen, no matter what the weather. Even if you sit in the shade, 60% of the sunlight bounces back up from the water's surface, and you can sunburn even under cloudy skies. If you're prone to motion sickness, bring your favorite remedies, just in case. Even though the water's surface looks calm from shore, ocean swells can make the boat ride seem like a roller coaster. Otherwise, you could be in for a miserable few hours. Wear a hat or visor, but be sure it's secure with a clip or chin strap. If the wind takes it, it's gone forever. Young children can get bored on a whale-watching trip. Bring along something to entertain them. And be sure they have enough warm clothing. The chilly wind on deck can dampen even the most excited child's enthusiasm. You don't need binoculars. Some whale-watching articles suggest bringing them, but those writers may have never been out on a boat looking for whales. Whales are sighted by scanning around, and they appear and disappear quickly. In a moving boat, it's unlikely you'd get the binoculars on them before they were gone. Migrating whales come closest to parts of the coast that "stick out" the furthest. Any place with "Point" in its name is a good bet, as are most of the coastal lighthouses. Your best bet for seeing a whale is to scan the ocean's surface. Look for a spout (a spray of water). After you see that, keep watching in all directions, looking for it to happen again. That will tell you the direction it's moving. In general, the migrating whales are going south in winter and north in spring. They swim about five miles per hour or the speed of a child on a bicycle. Keep binoculars handy, and once you get good at figuring out where they are, you can get a closer look. Grey whales normally swim in a cycle of three to five blows, 30 seconds apart, followed by a three to six-minute dive. They often show their tail flukes just before they dive. If they're swimming just below the surface and you're high enough to see the water's surface, they may leave a "trail" of circular calm spots on the face as they pass, making them easier to track. Good spots to look for whales from the California shore are summarized in the regional whale watching guides listed above.